IRISH ACTOR LIAM Neeson has said that “there is a bit of a witch hunt happening” in Hollywood when asked about the ‘MeToo’ movement. Over the past few months, a spotlight has been placed on allegations of harassment and inappropriate behaviour in the entertainment industry following a number of serious allegations about the US producer Harvey Weinstein. 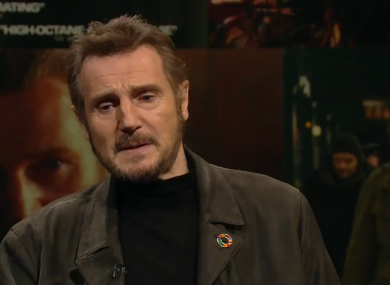 Speaking on RTÉ’s Late Late Show last night, Neeson said that the movement was “healthy” and allegations such as those were “across every industry”, but that “the focus was on Hollywood” at the moment. But he added that he was “on the fence” about harassment allegations against Oscar-winning actor Dustin Hoffman. He called the actions that Hoffman has been accused of as “childhood stuff”, but also distanced himself from that behaviour, saying “I’m not saying I’ve done similar things to what he’s done”. Hoffman has been accused of sexually harassing a teenage intern during the 1980s. Two other women have said Hoffman assaulted them on 1987 movie Ishtar, while another woman, a friend of Hoffman’s daughter, has also made allegations against the actor. When you’re doing a play and you’re with your family (other actors, technicians) you do silly things… and it becomes kind of superstitious, if you don’t do it every night you think it’s going to jinx the show. Earlier in the interview, Neeson gave the example of the dismissal of US radio star Garrison Keillor, who was dropped from his long-running local Minnesota radio show. Neeson said he had been reading about him recently. He said that the woman had said it was fine, but months later his station had received a call from the woman’s solicitor, and his radio station then “dropped him”. The ‘MeToo’ movement encourages victims of this behaviour to speak up about inappropriate incidents that have happened to them. At this year’s Golden Globes, actors, producers, directors and other film crew members wore black and ‘Time’s Up’ badges to show their solidarity with victims of sexual harassment in the industry and to signal their support for drastic change. Neeson is in Dublin this week to receive a Presidential Distinguished Service Award for the Irish Abroad, which highlights work by Irish people living overseas, and to attend the Irish premiere of his latest film The Commuter. Email “Liam Neeson says there's a 'witch hunt' in Hollywood over harassment allegations”. Feedback on “Liam Neeson says there's a 'witch hunt' in Hollywood over harassment allegations”.